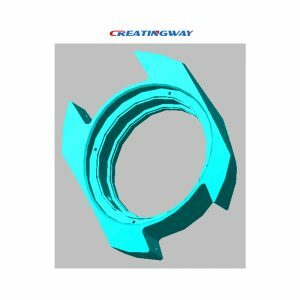 Now, Creatingway team receives a lots of 3D CAD files for new ideas and inventions from global customers. These various projects under different shapes, sizes and levels of complexity depending on what the customer needs made. But at this time, we always ask our customers whether they can also provide 3D drawing with STEP or IGS format together for checking for the structures before quotation and production. Maybe 2D drawing is enough for many simple the parts, but sometimes we’re unable to work directly for a couple of reasons. The two most commonly reasons that we have not get correct file formats and the lack of a 3d model from our customers. Today, we will brief introduce the importance of the 3D files format and 3D model. Why the 3D Drawing with STEP, X_T or IGS format is necessary for machining? 3D drawing is easy for us to make CNC programming and build product model data. Also, we can review whole product shape and assemble, It is very directly view whole product. Based on 3D drawing we are easy to make product weight and construction review. And we can calculate product weight and machined time, so we can make your quotation in 24 hours. When we use 3D drawing to calculate product machined time, so we can know the part machined time, then get you our whole product delivery time. If you only have PDF, we will need to make 3D drawing based on 2D, it will take us time to complete 3D, and delay production time 1-2 days. Also, based on 3D drawing, we can review part shape to know how to pack it, then we can know how to do better packaging and check out shipping cost. All of above these points are definitely tell us the 3D drawing is very important to our design and manufacturing. What is a watertight 3D drawing? The watertight 3D drawing (seamless 3D drawing) meanings all of surfaces in 3d model need be no openings, it must be under continuous mesh constructed, Imgaines when we will fill it up with water into one cylinder, if the cylinder is not made of watertight mesh, the water will leak out, so we can not use it to 3D print model or create programming, so we must be careful to this drawing, we have to revise it to watertight and no opening on 3D model, then take it for working. Why is a watertight 3D model important? A watertight 3D drawing is very easy to build 3D model, creating a CNC programming and 3D printing prototype, it can be avoid lots of space error when working, If this is non watertight drawing, it will generate non continuous mesh surface, and encounter error message when make programming, like repair surface smooth etc. So our engineer will take lots of time to repair it or re-drawing, as non-watertight drawing can’t be worked. so finally, it will directly delay our production schedule and manufacturing time. What are the preferred file formats for your CAD drawing? The best CAD drawing is to provide the STEP or X_T format for exchange of product model data. Our engineer can use them to make any transform to CNC programming or machined suggestions. The STEP or X_T formats can make the product profile integrity and uniform. Also, the X_T format can show colors area which need to make tight tolerance, so we will be more attention to them . Another 3D drawing format like IGS, which have very good compatible to STEP or X_T format transfer each other. We currently have used solidworks, UG, 3D master software to support these different 3D format to satisfy our customers needs. Can you send other 3d drawing formats? Both STEP and IGS are the preferred the format, and they can used with more different 3D software. Of course, you also can send us the 3D format like CAD, STL etc format, we can use STL to review the parts shape and feature. Also, we can use STL to make 3D printing, our team will use most advantage software to match your drawing and design, in order to make your project easy, and make whole shipment no delay. At Creatingway, our engineering team will use different software and equipment to offer you best support and services, ship you excellent product quality. If you are ready new projects, then send out one inquire to start now.